WATERLOO, WI (BRAIN)—The European Patent Office has notified Trek Bicycle that its patent application on its Active Braking Pivot (ABP) suspension system (which is already patented in the United States #7,837,213) has been approved and will soon mature into a patent in Europe. CHATTANOOGA, TN (BRAIN)—Kirk Pacenti is aiming for a new industry-wide standard when it comes to cassette bodies for 10/11 speed systems. BEAVERTON, OR (BRAIN)—The FlipSide bike carrier is being recalled, according to Yakima. A small number of units shipped from April 2008 through June 2011 have malfunctioned. In these instances, the FlipSide’s upright mast has folded to the side while the vehicle is in motion. DEER VALLEY, UT (BRAIN)—Lazer, best known for its helmets, is adding a line of eyewear next season to complement its helmets, said Lazer’s Brian Kee. Like the helmets, QBP will distribute the eyewear making them an add-on sale, said Kee, a former employee at Tifosi, a competing eyewear brand. DEER VALLEY, UT (BRAIN)—Cannondale unveiled a line of new helmets for 2012 at PressCamp that will give its dealers another choice when deciding which helmet brands to stock for the season. The new line will range in price from $109 for its top-of-the line road helmet to $39.95 for entry-level riders. NUNSPEET, The Netherlands (BRAIN)—What was reserved only for Shimano Dura-Ace, Di2 electronic shifting technology can now be found on Ultegra, bringing it to a wider group of consumers. TORRANCE, CA (BRAIN)—Niner Bikes' CVA (Constantly Varying Arc) Suspension Technology is now covered by U.S. Patent No.7,934,739. WASHINGTON, D.C. (BRAIN)—The U.S. Consumer Product Safety Commission, in cooperation with Quality Bicycle Products, has issued a voluntary recall of about 100 Civia bicycle racks for mounting over the front bicycle wheel. SAN DIEGO, CA (BRAIN)—NiteRider's new rechargeable light line has more than doubled the light output over previous year's product offerings. In addition to its high LED outputs, the company revealed a new entry-level series rounding out the entire line of commuter products. BLOOMINGTON, MN (BRAIN)—QBP has created Whisky, a parts brand offering carbon forks, handlebars, seat posts and bottle cages. Whisky will roll out a series of unidirectional-carbon cross, mountain and road forks in late July and early August. The lineup will include disc-specific cyclocross forks. WASHINGTON, D.C. (BRAIN)—The U.S. Consumer Product Safety Commission and Health Canada, in cooperation with Bell Sports, have issued a voluntary recall of about 31,100 full-face bicycle helmets in the United States and about 2,500 in Canada. OVERLAND PARK, KS (BRAIN)—Bollé is once again trying its hand at cycling-specific eyewear. The brand had cycling-specific gear for a short period in the late 1990s as well. BEAVERTON, OR (BRAIN)—Yakima Products is now working with its dealers to recall its FrontLoader roof rack. LAGUNA HILLS, CA (BRAIN)—The International Cycling Union (UCI) has approved the first models of frames and forks following requests submitted by their manufacturers. 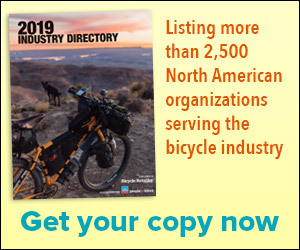 WASHINGTON, D.C. (BRAIN)—The U.S. Consumer Product Safety Commission, in cooperation with Procycle Group of Canada, has issued a voluntary recall of about 325 Rocky Mountain bikes. The front fork steering tube can break, posing a fall injury hazard. WASHINGTON, D.C. (BRAIN)—The U.S. Consumer Product Safety Commission, in cooperation with REI, have issued a voluntary recall of about 160 Novara Fusion bikes. The alloy steerer tube could separate from the fork causing the rider to lose control, posing a fall hazard to consumers. Stromer E-Bike Now Charging Through U.S.
GREENVILLE, SC (BRAIN)—The electric bike category has just gotten a little more competitive with the Stromer’s launch into the United States. WASHINGTON, D.C. (BRAIN)—The U.S. Consumer Product Safety Commission, in cooperation with Salsa Cycles—a subsidiary of distributor Quality Bicycle Products—issued a voluntary recall of about 6,500 Salsa handlebar stems. The handlebar stems can crack or break, posing a fall hazard to the rider. OOLTEWAH, TN (BRAIN)—For the second year in a row, Quintana Roo (QR) will partner with Infinit Nutrition to give away a new 2011 CD0.1 frameset at midnight on January 1. VERO BEACH, FL (BRAIN)—Ask Alex Allen how his rack business has fared in light of a down economy and you’ll sense a bit of hesitation. He timidly admits his company has “hung in there pretty well,” but he’s not one to boast, or let the competition in on the secrets of his success.